Let's see....no money, no credit, bad drug habit...how's one supposed to live? Why, rent a 5' x 10' storage locker, and run a little 'zip cord' up to the PoCo splice, of course. Ironically, I was there to remove the non-functioning timer....there was already 24-hr power to the light in the locker! A note of caution to sparkies....Meth heads, for some reason, seem inclined to get "clever" with the electricity. Be wary out there. We haven't had a picture like that in here for a wee while. Saw something like this in Thailand - scary ! trouble was they tapped of across the phases so blew all the things that they had connected. 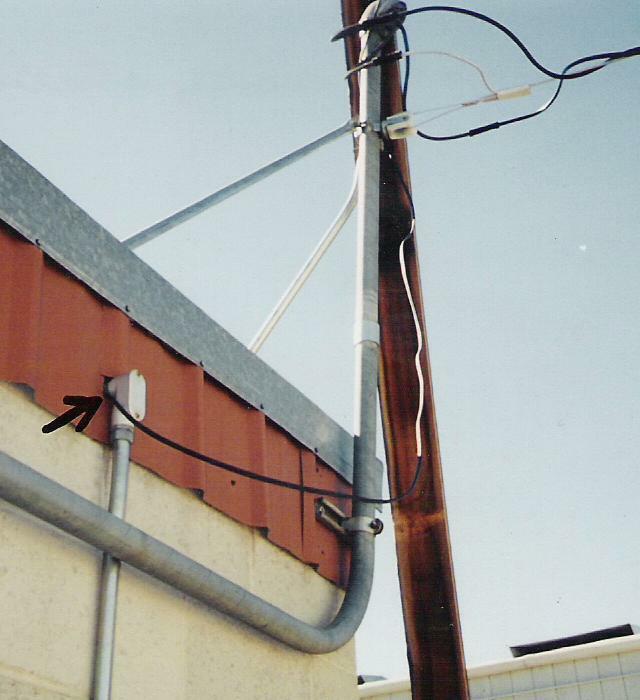 HV wiring on sides of buildings that you could reach leaning outta the window. Yepsome seriously scary things ! If you want to send the pictures over here, I'd be happy to post them for you. Well, my electronics workshop teacher told me a nice story yesterday... must have happened before or just after WWII I guess. He said his grandfather used to have two long wooden rods with metal hooks at the ends that were connected to cords, and using these he hooked up to the street lighting... "what's wrong with that? the wood is an isolator? " I remember one incident when a signage cotractor got lit at 24KV . He is DOS (Dead On Scene)I guess, and my university went dark for ~30 minutes. (MEA had to clear the line then reset a CB in a substation.) they should have consult MEA before doing something near HV. How common is this sort of thing around your area?. Seems like a dangerous sort of a thing to be getting into. Happy to say that it's pretty unusual here...this pic got a lot of "wows" at the parts house.